It was the perfect sunny day for it. Until five minutes before we set out when it started raining. Thank goodness for bumping into Paul whilst I was doing a last minute reccy of the places and the plants we would be stopping at. Clouds were appearing. He would bring me an umbrella. 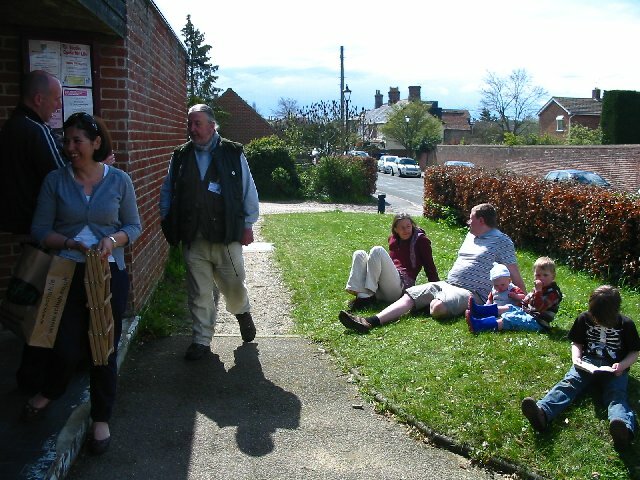 The weather didn’t seem to bother anyone though and at 2.30 over twenty of us put up brollies and pulled over hoods and set off around Bungay to see the wild plants pushing through everywhere from cracks in the pavement to churchyards to hidden alleyways behind the town centre. And it wasn’t just the adults who wanted to come along. The children were fascinated by the plants and often knew them by name. The intent behind the walk was to consider these uncultivated plants beyond their usual description as ‘weeds’ and look at their medicinal qualities and uses. And in line with the Spring season, we focused on the energy-moving, tonic, galvanising properties of the plants as well as how they clear and cleanse the system after the sluggishness of winter. And there they all were in abundant supply: nourishing energisers and diuretics, dandelions and nettles. Lymphatic booster, cleanser and energiser, cleavers. Even mega Chinese herbal tonic and superfood Gojiberry, also known as Wolfberry and Duke of Argyll’s tea tree), was growing in abundance on Castle Meadow. After the walk we returned to the library where Charlotte prepared everyone a Wild Green and great tasting spring tonic tea made from the leaves we’d collected. It included dandelion, nettles and cleavers with a sprig of peppermint and thyme from the library garden. Bungay Community Bees’ honey was an optional extra. Next month we welcome Norfolk-based medical herbalist Julie Bruton-Seal and her husband Matthew Seal, co-authors of the best DIY handbook on making home remedies from wild plants I know, Hedgerow Medecine. Come along to Bungay Library at 3pm on Sunday 13th May, where Julie and Matthew will talk both about the book and the practice of Hedgerow Medicine. Don’t forget to visit the Garden Street Market beforehand and make it a day with plants. 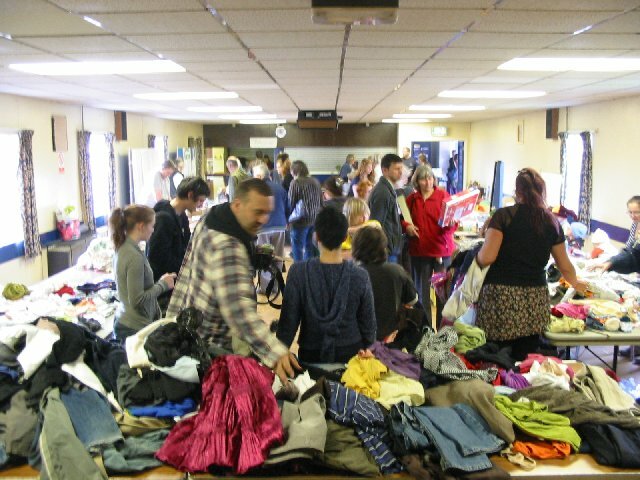 For our fifth Give and Take Day, Sustainable Bungay returned to the Community Centre in Upper Olland Street, where between 10 and 1 on Saturday a steady two-way stream of clothes, furniture, childrens’ toys, kitchenware, tools and garden equipment came and went with the Givers and Takers (most people doubled as both). The SB Give and Take crew did everything from pick ups and deliveries to press and publicity and the provision of soup, cakes and refreshments aswell as manning the door and the tables and being on hand to provide information. We also took the odd moment off to sit in the sun! And this time there was more: a free bicycle maintenance workshop with Richard Simpson from Mutford in the next room. A display of the work of Emmaus in Ditchingham. For the hardworking organisers (all voluntary) a delicious lunch of spicy soup and focaccia, provided by Happy Mondays Community kitchen. And we were all thrilled by the new A-boards made by Roger for use at all our events – both extremely useful and handsome. Thanks Roger. Among the main aims in putting on the Give and Take Days is to reduce waste in general and prevent stuff going to landfill in particular. This time only a couple of pieces of furniture went to the dump. And to the landfill? Only the bag Eloise is holding in her hands. All packed up with the room swept and ready to go. The Give and Take crew sans Daphne who was at the bike maintenance workshop until 4. Rose led Bungay Community Bees in a seed sowing session this week. It was great learning more about the plants we were hoping to raise and I really enjoyed hearing a boy’s comment about being in awe of tiny seeds being able to transform and grow into huge plants. Well, it is pretty amazing isn’t it. About 10 enthusiastic members of Bungay Community Bees met last Sunday at our Flixton hive site, for an afternoon of sowing and transplanting trays of pollen and nectar rich garden and wildflowers for our own gardens, our hive sites – and for distributing through our upcoming Beehive Day on July 15th. Some of the seeds sown were pollen and nectar rich mixes of both annual and perennial wild and garden flowers and some were just single plants – all known for being valuable pollen and nectar plants for bees as well as bumblebees, butterflies, moths and pollinating insects. Among the seeds sown were a Bumblebee mix, Chris Skinner’s wildflower and annual pollen and nectar mix, an English Wildflower pollen and nectar mix, Calendula, Scabious, Cornflower, Mullein, Borage, Viper Bugloss, Anise Hyssop, Linaria, Sunflower, Cosmos, Phacelia, St John’s Wort, Teasel &. Marsh Marigold. We also transplanted several trays of Primroses and Great Willowherb for planting on the banks of the new big wildllife pond at our Flixton hive site. Before the meeting we braved the biting wind and oncoming rain, to take a look at the wildlife pond and surrounding one acre perennial pollen and nectar wildflower meadow that we sowed last autumn. At the moment, what’s mostly visible are the non-invasive grass species that were sown with the wildflower mix, a few annual and thistle seedlings, and quite a lot of small cranesbill and speedwell plants. We are unlikely to see many of the perennial wildflowers until this autumn or next spring because they are very slow growing. We will be re-visiting the meadow throughout the year to chart and photograph it’s progress and to plant up the pond and pondside with native plants in the coming weeks. Unfortunately only one photo of the pond for now (and none of seedlings emerging) because it began raining as soon as I got my camera out! Most of these can be sown in trays and then grown outside or in a cold frame until big enough for transplanting. Those which will need a sunny windowsill or the protection of a greenhouse and polytunnel until frosts have passed are: Cosmos, Sunflower & Echinacea. Some sunflowers are hardy enough for outdoor sowing but in a cold wet year like this, will do better with some protection at first. (Even an upended 5 litre water bottle with it’s bottom cut off will do over a direct sowing). Remember when you do transplant your seedlings into your garden, to do so in warm, sunny spots and to aim for clumps or drifts of flowers, to make it easier and quicker for bees and insects to get the food they need. Bees and pollinating insects feed from plants in sunny places. For this year’s fourth Plants for Life event join us for a walk around central Bungay’s streets, alleyways, churchyards and meadows taking a different look at the plants we often call weeds. In line with our Plant Medicine Bed at the library and the theme of plants as medicine this year we’ll explore some of the ways those ‘weeds’ might be good for our health. We’ll depart from Bungay library in Wharton Street at 2.30pm prompt on Sunday 22 April and return to discuss what we’ve found after the walk. Everyone welcome. Led by Mark Watson. It’s that time of year again when everything starts afresh. The green is returning to the landscape, seeds are being sown and stuff is being thrown out. And not to your local recycling centre and into landfill but to another Give and Take Day on Saturday 21st April 10am-1pm at the Community Centre in Bungay. If you’ve got something in decent condition that you no longer need – whether it’s an item of furniture, clothes, kitchenware, garden tools, books or toys (but NO electricals please) – bring it along and we’ll find it a new home. You might just find a hidden gem and all for free. There can be great encounters with people, and the history of their unwanted objects can make for some interesting stories. You never know what’s going to come through the door. Anything that hasn’t found a new owner by the end of the day will be collected by the local Emmaus centre in Ditchingham. You don’t have to bring something in order to take something away, everything must go! With a hose pipe ban in operation across parts of the valley, many of us are religiously emptying our baths with a watering can. There is a simple satisfaction in not letting water go to waste. And it makes us more conscious of the circulation of resources into and out of our homes and lives. Do we use more than we need? Do we consider the lifecycle of each piece of rubbish that’s dropped into the black bin? Much of what we throw away will sit in the ground for a very very long time. By becoming aware of this fact we can influence our daily actions and reduce our personal impact on the planet – and feel great about it! Whether it’s driving, eating, buying, or simply enjoying ourselves we can change our lives in so many ways. We can live more slowly, more softly, more simply or even go on a Rubbish diet. The Rubbish Diet was started in 2008 by Karen Cannard in Bury St. Edmunds who took up a week long challenge to seriously reduce the amount of rubbish going into her family’s “Black Bin”. It really took off and you can find out all about it at our next Green Drinks evening at the Green Dragon (Tues 17th April). You might even decide you want to give it a go. So I challenge you now to have a jolly good rummage for all that stuff you really don’t need that’s cluttering up your space and bring it along to the Community Centre in Upper Olland Street, Bungay on Saturday 21st April 10am-1pm, where there will also be an opportunity for some free bicycle maintenance.